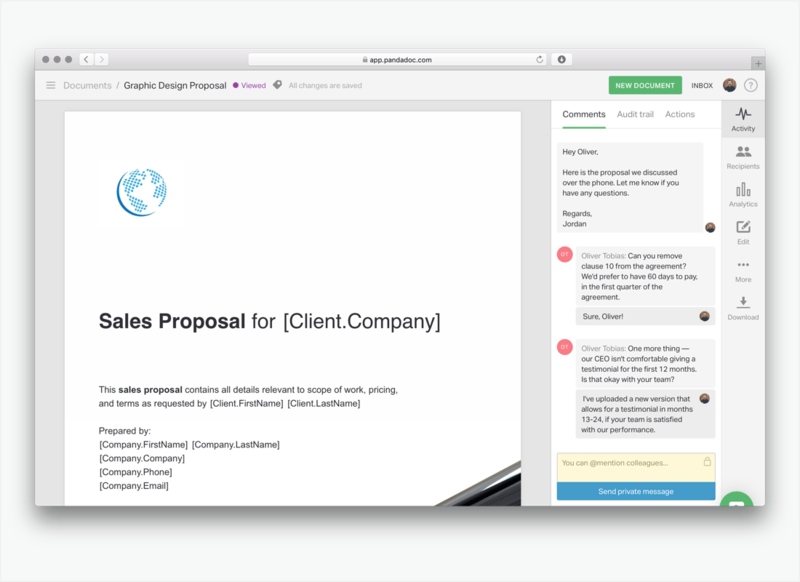 A fast, easy, and absolute gorgeous way to generate proposals and close deals faster. PandaDoc is all-in-one document creation, delivery, tracking and eSignature tool with proposal generation software at its core. Each of these features are powerful — and so much better when used together with the documentation generator functionality. Looking to raise the bar to meet sales targets? A sales proposal generator like PandaDoc is your key to producing professionally looking, high-impact sales documents that win more deals. Overhaul your entire contracts and proposals process with streamlined approval workflows and document analytics. Sales operations managers can now extend existing CRM functionality with robust document automation tools. The outcome? A more scalable, effective sales team spending more time on nurturing prospects and winning deals than admin tasks. A business proposal generator is an effective way for marketing and sales to work together. With standardized templates and a content library at their fingertips, sales reps can use up-to-date, properly branded marketing content proven to have a high impact on close rates. PandaDoc online proposal generator allows you and your team to streamline the creation process with reusable content like product descriptions, legal clauses, and price quotes. Add a pre-built template and image library — and your proposal is halfway done when you’ve only just begun! With our proposal generator, editing, customizing and personalizing your content and quotes has never been easier. Coupled with automated approvals and role-based content locking guarantee that there are no errors when the document is out the door. From creation to send, and even after send, dialog happens at every stage of the proposal process. In-document collaboration helps content authors collaborate with co-workers, get approvals and solicit feedback directly on the proposal. Another important feature is document versioning, which helps both parties keep track of document updates during the negotiation process. The online proposal generator improves your document even when the ball is in the prospect’s court. Document analytics provide full visibility into how the recipient interacts with the document: if they opened it, how many times they viewed it, and how long they spent on each page. With such actionable insights at hand, you can anticipate reaction and adjust your follow-up activities. PandaDoc proposal generator integrates with industry-leading sales enablement, payment, file sharing, customer service and CRM applications out of the box. Don’t see your favorite tool on the list? Contact our development team to see what custom integration options are available. PandaDoc offers best-in class features as a proposal generator — and much more as a sales enablement toolkit. Robust CPQ functionality, multiple workspaces, cost and margin calculation, document analytics, payments and eSignatures offer the functionality both you and your customers will love. The PandaDoc proposal generator is hosted on the AWS public cloud and leverages all the investments Amazon makes to assure compliance and infrastructure security. All data stored by the service is encrypted at rest with AES-128 — the security standard approved for top secret governmental data.